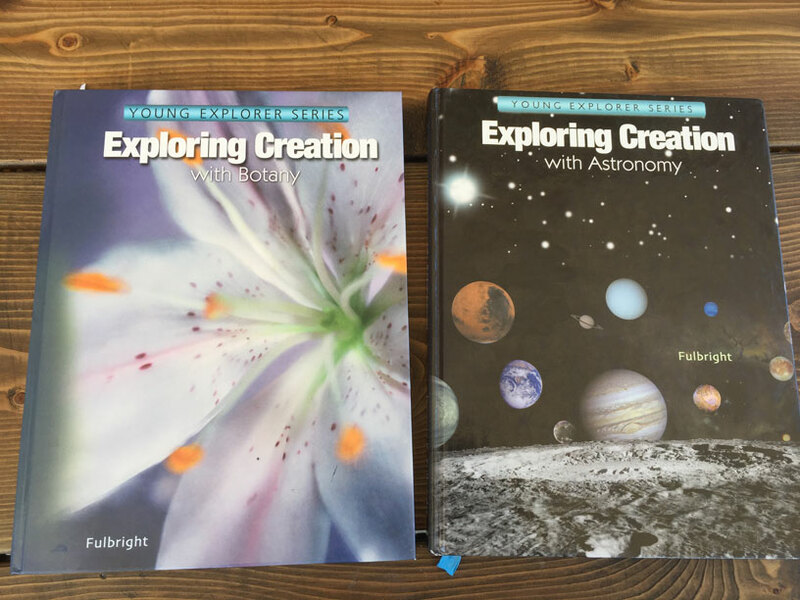 I always have people ask me what curriculum I use for our homeschooling journey. I feel so incredibly blessed because the curriculum that I use fell into my lap the moment I needed it. When we started homeschooling 2 years ago, I was researching out on the big wide web and felt like a tiny sardine in the midst of killer whales. I was so overwhelmed and terrified to take this step, and wasn’t quite sure how I was going to do it. (Here is my why I started homeschooling). Here is a quick overlook of the curriculums I use, yep you heard right! I use lots of different curriculums. There are certain things I love about each one. This was the curriculum that fell into my lap when I needed it. 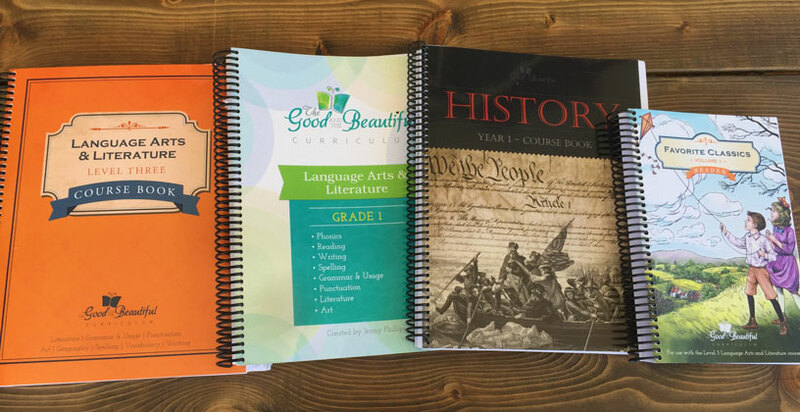 I had 2 friends mention to me to check out The Good and Beautiful Curriculum. I looked it up and fell completely in love with it and knew this was exactly what I needed. This curriculum is written by Jenny Phillips who is also a songwriter and an amazing person. Here are a few reasons why I love this curriculum so much! It covers everything under the language arts/english umbrella; phonics, sentence structure, spelling rules etc. All recommended books are clean and teach great values. She incorporates art and history in the lessons. I love this aspect because art is not my thing. My boys are getting exposed to great painters, and other notable people in history. It is Christian based, and talks of God often, which I absolutely love. I love when we talk about something in the scriptures for our scripture study, and then it is reiterated in the curriculum. The“Good and Beautiful”, is also very affordable. Younger grades can get the PDF version for free. She has now since come out with a history and science curriculum. It is so uplifting and provides so many learning techniques. A must for a busy mom of 5 boys, this curriculum is an open and go with little preparation as a parent. I learned right along side my child. We currently use Apologia books for science. Last year we studied astronomy, and my boys loved it. You read about a certain topic for a couple days, and then spend a couple days doing experiments and activities related to that topic. This year we have been studying botany. One activity we loved, We created our own green house that we now use in our home on a larger scale! Here are some we have used and LOVED! Our math curriculum is the only curriculum I have changed since starting. I will tell you this, you pay for what you get in the math world. 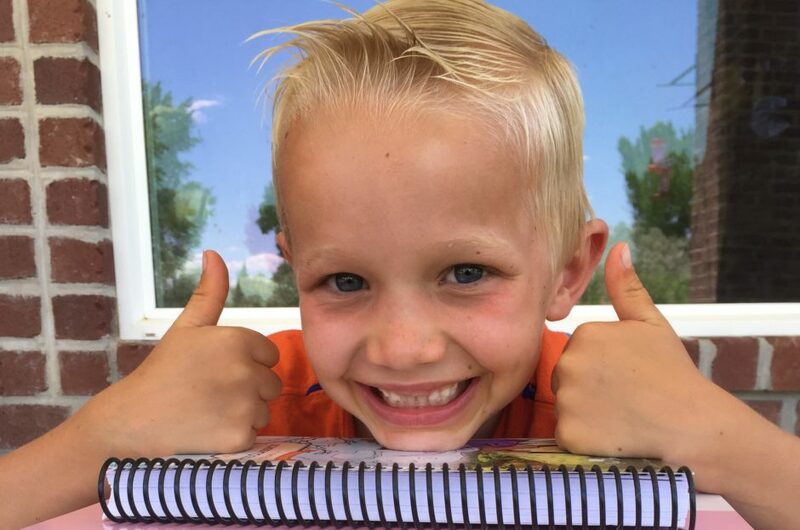 I initially did an online program and workbooks off of Amazon, but honestly my kids hated it. Here is why. We were in the month of January, and this program requires you getting on the computer and going through 30 minutes of different exercises/games around the world of math. Sounds great right?. Yet my son whined and cried every time he had to do it. One day I went and sat with him and watched him for a short time. I quickly found out why he hated it. He was bored silly! 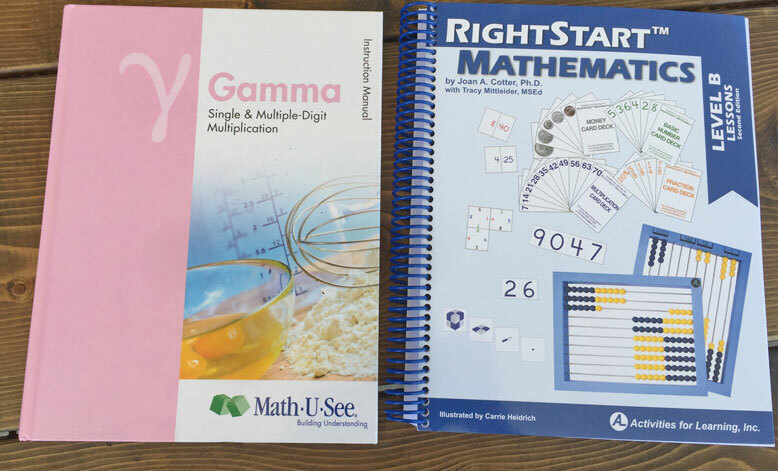 Because it was an online program it it set for 1st grade math, 2nd grade math, etc. It didn’t allow you to go ahead if a concept was easy for you. My son at this time was able to add 3 digit numbers together and this program was having him count to 60. WHAT??? I told him he didn’t have to do it anymore andbegan looking for a different curriculum. A computer program was not what my boys needed. We now have changed to Math U See which can be a little pricey, but I have seen success. It helps me as a mother feel confident in what I am teaching them. It comes with a workbook and a teachers manual. To cut down on cost, I cut the binding off and put the page my child is working on in a sheet protector. They then can use a dry eraser marker to write their answers. As your child gets older though I have found they need more room to write their answers and the dry eraser marker makes this difficult. After doing Math U See for almost 2 years, we are trying a knew math called Right Start Math. My ONLY complaint with Math U See is that it teaches by subjects, instead of a smattering of everything. I don’t think this is bad, my boys however got a little bored with the same subject. I will update this as we begin our new math journey with RightStart Math. My husband and I decided we wanted our boys to learn Spanish. My husband is fluent in Spanish and uses it regularly. For Spanish we use Rosetta Stone and Duolingo. We also take Tech classes through an online school called My Tech High (ONLY in Utah). They have a bunch of great classes from entrepreneur, computer programming, rocketry, photography and much more! History is a hit and miss with us because our English curriculum covers enough history for my young boys, but JennyPhillips.com has a fabulous history course that is worth checking into. Any questions I would love to answer them for you! GOOD LUCK!! Here is an article that every parent should know before they start homeschooling.